Bolivian Betanzos invites you to meet its secrets! The tourist site is located 40 kilometers from Potosí. Among its attractions are the hot springs. The rock art of Lajasmayu, the figure of the Christ of Tecoya, the estate of Mojotorillo, Kiwi Kiwi terraces and thermal waters are some of the attractions that has the population of Betanzos (Potosí), place where you can practice, scientific, cultural and adventure tourism. Betanzos, Cornelio Saavedra Province, 40 kilometers from the center of Potosi and 107 from the city of Sucre, it is located in the middle of a beautiful valley surrounded by mountains. Its climate is around 18 degrees Celsius. Heritage features. The archaeological remains found there, include the existence of little polished arrow heads, which reveal that the place was inhabited approximately 6,000 years ago. Remains of chaqui, huruquilla, yura and yamparaes cultures. They are characterized by burial in baskets of plant tissue near the villages. Also, the presence of habitats in akros or pucaras. In addition, traces of geometric decorations and agriculture in terraces or takanas, among others. Lajasmayu 1 and 2. Lajasmayu is the most important site of Betanzos by its rock art. There are currently projects of protection and preservation of the site. Pictorial signs are along a wall. You can also see representations of camels and anthropomorphic, which were superimposed with crosses, as a clear symbol of the religious syncretism that occurred in Hispanic America. Paintings called Supay mill Q ‘aq’ to (the Devil’s Mill) can be seen in a ferrous Sandy oblique wall – red by the oxidation of iron. Most representations show geometrical, zoomorphic and anthropomorphic figures. Jatun cave. It’s an overhang of sandstone with an extension of 18 meters. Inside this cave you can see petroglyphs and pictographs scattered on the walls and in basalt formation. There are more than 40 motifs painted and nearly a hundred engravings. Color prevailing is red, with anthropomorphic and zoomorphic, reasons, showing hunting scenes. Road betanzos-pignasi. This is of interest for the landscape variety that has, since it passes the remains of an inca trail to very attractive natural landscapes. There are remains of cave pictorial signs in the place called Rincón. Sector Tecoya. This place located at 3,300 meters above sea level, a stony figure of approximately 40 meters height, known with the name of “Christ of Tecoya”, showing an amazing way is his face, his hair and the mantle which is covered, in a meditation position. 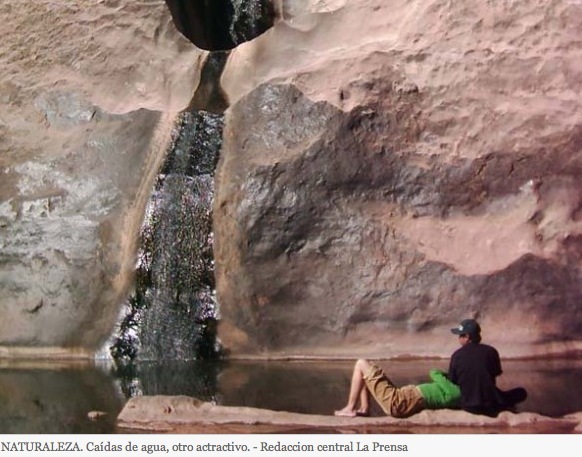 At the top you can see a beautiful waterfall known as the Pajcha of Tecoya. 40 kilometers from the city of Potosi is located the town of Betanzos. August 24: feast of San Bartolomé. October 7: feast of the Madonna del Rosario. December 4: celebration of the patron of Santa Barbara. So, what are you waiting for, plan a trip and enjoy!